← Wednesday Vignette – two sides… at least! This entry was posted in Wednesday Vignette and tagged appetite suppressant, blue, bottle wall, color psychology. Bookmark the permalink. This sounds like a good restaurant! Enough to override the powers of blue. (hehe!) Might you name this worthy restaurant for inquiring minds? I’m sharing a Wednesday Vignette inside my post this week–a photo tour (Part 1) of Zumwalt Prairie. http://lansinggardendesign.com/blog/2017/11/26/zumwalt. Scroll down to pretty much the middle of the blog. Our kitchen was blue when we moved here and I was still able to eat constantly. Where there’s a will, there’s a way. 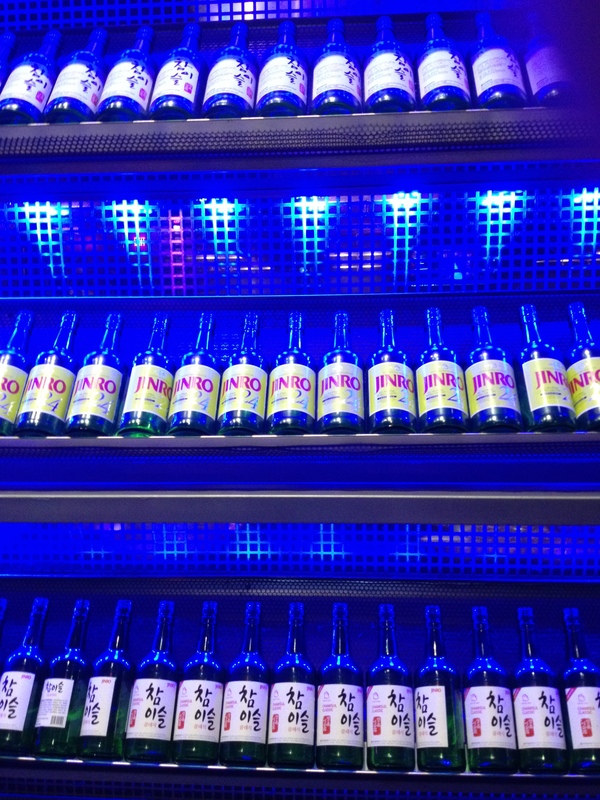 The wine bottle display looks cool but not particularly appetizing. Cobalt bottles used to be used for poison. Supposedly the unusual color would be easier to spot using only candlelight to avoid inadvertently taking a swig of something harmful or fatal. Yeah, maybe. This was definitely not what I would call a quiet, relaxing place. Very urban, very young ,and very K-pop, but with very tasty food that made it all worth it! Gorgeous, sensual, inspiring, that blue! “Blue, blue, electric blue – that’s the color of my room…” Walking in to it made me think of David Bowie’s song. Haha – maybe it just tasted that good BECAUSE of the artificiality of those lights? You know, that it somehow enhanced the flavor… No, seriously – it was very tasty!